B.J. 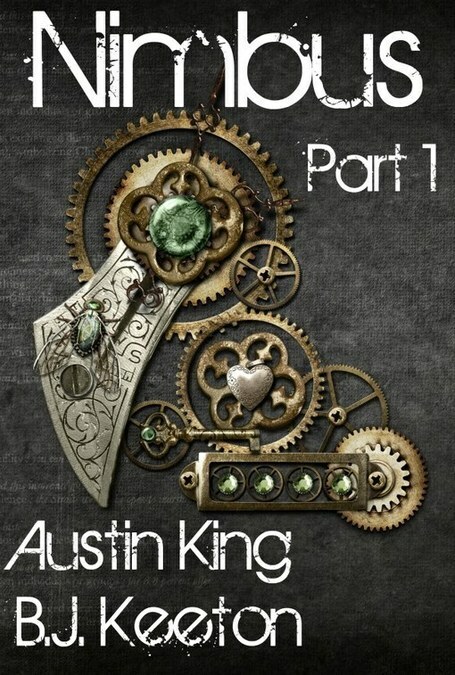 Keeton and Austin King, Nimbus: A Steampunk Novel (Part One). Amazon, 2012. Pp. 106. ASIN B007YJ5A82. $2.99. I’ve a confession. For personal reasons I won’t bore you with, I’ve sat on writing this review for ages. 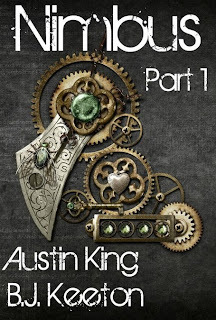 When I took the review on, Nimbus: A Steampunk Novel Part One was the first instalment of a four part work with the other three parts not yet written. Now, all four episodes are written and available for your reading pleasure, and in many ways I’m happy with my delay. I didn’t watch any of the Lord of the Rings until all three films were ‘out there’, and I’ll do the same with The Hobbit. I like to look at completed works—that’s my excuse, anyway. Nimbus is billed as a Steam Punk novel, and given it’s a tale of steam-powered airships and wheelchairs there’s some truth in this. But the technology is not forced upon the reader. Instead, it forms a subtle background to a tale (so far) of isolation, but there’s more going on than the whir of cogs and the hiss of steam. There’s the fog—it’s origin is not explained in part one and we’re simply to accept it’s permanently there and presumably covers the globe—it strips the flesh from those unfortunates exposed to it, and has split the world in two between those ‘Dwellers’ who scurry about in ‘burrows’ below ground, and those who live and work on the airships and in ‘sky ports’ above the clouds (and the fog). The currency of this world is water. The water is spoiled at ground level (by it falling through the fog, presumably), and the airships seek out storms to ‘hose’ in clean water as cargo to sell at the sky ports and ship below. Our hero is Jude Finley, a ‘Hoser’ aboard such an airship named the Gangly Dirigible. Jude was once a Dweller, but has risen from the burrows by means not disclosed to a hard, but better, life above the clouds. Life is tough upon these airships, and when the Second Mate is incapacitated, Jude has promotion somewhat forced upon him, and we see him begin to grow in character, a trait I assume will continue in parts two through four. Having docked a mysterious, abandoned sky port, Jude leads an exploration party. But here great danger lurks, and not wishing to impart too many spoilers what occurs is a fine cliff-hanger for part two. A second story arc involves Demetrius Rucca, the wheelchair bound son of the High Prelate. Struggling against obvious parental disappointment, Rucca’s is a life ripe for rebellion. And, by embarking upon a life of crime, rebellion surely begins—slowly, reluctantly at first, as Demetrius gathers his own followers and sets off on adventures of his own. As of the end of part one, the two main arcs remain separate. So far so good, but does it all work? In some ways the two characters are similar. Both seek to find themselves, to emerge from the shadows of the burrows or an overbearing parent. Of the two main protagonists, I believe I find Demetrius most interesting, which is a shame as he’s given a disproportionately smaller share of part one’s narrative. I felt Jude to be lost a little within introductions to his crewmates—lots of names are thrown in at the beginning confusing me somewhat, and add to this I always associate the name Jude as female. This, I felt, slowed the opening down as I paused to try and figure out who was who. In addition, I think the story starts too early—given that some of the ‘hosing’ scenes are dramatic and gripping, surely it would be better if the story began in the middle of the storm rather than the middle of an airship’s bunk. Rucca is introduced immediately as a flawed character. In one respect, given his disabilities, the reader is drawn into sympathising with the character, but this is turned around when we’re shown how poorly he treats his servants and those ‘beggars’ below him (and that being the son of the High Prelate he clearly wants for nothing in a world in which most are even without clean water). The result is fine characterisation, toying with the readers’ loyalties and interest. By comparison, Jude seems a little less rounded. But there’s enough in part one to suggest Jude will grow. I like that the technology is not Nimbus’ reason to be. It doesn’t get carried away describing nuts and bolts and things that clunk. It means as a setting, as a world, I’m happy to suspend belief and get on with the human tales instead. I hope this continues in parts two, three and four. Of course, there’s also something of a gamble here on the part of the authors—will the lack of technological detail exclude the die-hard Steampunk fan? Will the promise of an ‘easy’ technological read convince the virgin Steampunk reader to look in? In theory, the work could fall between the two and attract neither. And that would be a great shame, as I think there’s a place for both camps in reading Nimbus. The sky ports are interesting places. They have a kind of duality to them that suggests they were there before the fog plunged the world into chaos. Despite the technology obviously being in place for them to exist, and in my mind that conjures up shiny, sterile, metallic, futuristic places, they’re shown as almost run-down sea-towns full of old bluffs singing sea shanties in dark pubs. Or perhaps it’s merely that people of the sea remain people of the sea even when they’re people of the clouds. Either way, I think it’s a nice touch. There are possible liberties taken with the plot. If water is so precious, why use steam at all? There are hints to address this by suggesting ‘contaminated’ water is the driving force, but it seems to me a civilisation that can put cities above the clouds would find alternatives to steam if water were so precious. I also wondered about the rain cycle—if water falling through the fog is spoiled then why is water vapour not affected on the way up? Again, to be fair, there isn’t a direct statement that the fog is the spoiling agent, so maybe that’s just me being picky. And to be even fairer, these are not things that jumped out at me as I read, more they are thoughts I had later in considering this review. This, I think, is a compliment to the work in that it drew me in and I was reading for pleasure rather than analysis. Overall I felt Nimbus to be a very entertaining read, and I will be seeking out the further instalments to my Kindle soon.